The Antalya region of Turkey sits majestically on the Mediterranean coast of Turkey. Backed by the Taurus mountain range and fronted by the turquoise blue sea, it’s earned a well-deserved reputation as the second most popular holiday destination in the country. There are many reasons why but the vast diversity of coastal holiday resorts entices many. 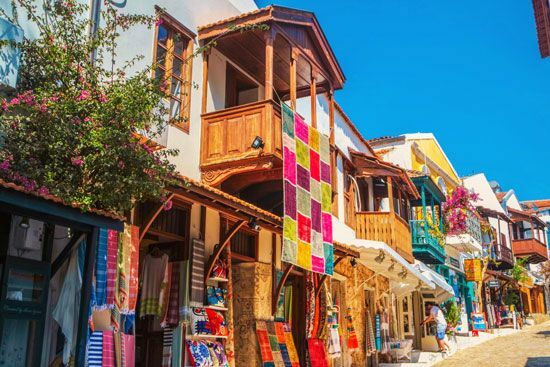 From small towns to sports havens to large districts renowned for their vibrant nightlife scene, holiday makers easily and cheaply tap into the choice of the best hotels and all-inclusive holiday resorts in Turkey. Each report distinctly displays certain characteristics and whether you are a solo traveler, group of friends or a family, finding a place to stay that suits your perfect idea of a Turkish holiday is easy. Alanya, at the eastern tip of the Antalya coastline, is an all-rounder satisfying everybody. Families particularly like it because of the vast range of things to do, especially for kids. Meanwhile, groups of young friends gravitate to the vibrant nightlife scene that parties well into the early hours. As well as British holidaymakers, Alanya is a firm favorite of many Russians and East Europeans. Every type of accommodation is for sale, including room only, bed and breakfast, self-catering or all inclusive. Popular hotels include the Eftalia Holiday Village, Sentido Gold Island, and the Sun prime c-lounge hotel. Heading in a westerly direction, the next popular holiday resort is quaint Side, a marvelous blend of old and new, modern and traditional. The new part of the town is built on the historical ruins of the old district; therefore, a surreal atmosphere captivates newcomers to the holiday region. Famous landmarks include the ancient theater and the Apollo Temple, a stunning structure when backed by the vibrant Mediterranean sunset. A laidback atmosphere and excellent harbourside restaurants make this destination a firm favorite of couples. 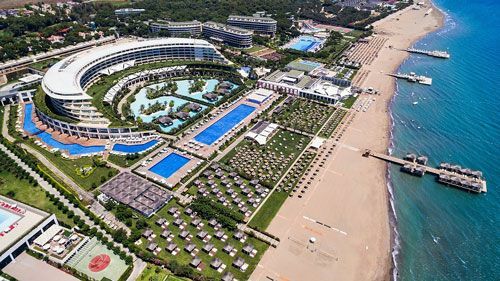 On the outskirts of the main town, many large all-inclusive hotels make a roaring trade including TUI Sensimar and Barut Acanthus. More central accommodation choices in the heart of the town include Side Tuana, Sato Hotel, and Villa Onemli. A short distance from Side holiday resort is Belek town, otherwise nicknamed the golfing capital of Turkey. Hosting famous people such as Barrack Obama and Tiger Woods, its clientele is different from most other places for two specific reasons. The first is more than 20 state-of-the-art golf courses attracting international players from all over the world and the second is the extensive spa treatments and packages offered by top notch, luxury hotels like the Gloria Golf Resort, Maxx Royal or the Sueno. Belek does also appeal to beach lovers, but it's golfing reputation promotes itself as a property hotspot for foreign real estate investors looking to cash in on the low prices of Turkish property. The king of the region is the city center, offering boutique hotels, fine dining restaurants and an abundance of shopping and party choices. It is also home to Europe’s most luxurious hotel called the Mardan Palace. With suites rooms costing more than £1000 a night, guests expect and receive the finest of hospitality, service, decor and design. Those who don’t have the cash to splash or prefer to keep their feet on the ground would do well to look at boutique hotels in the old part of the city called Kaleici. Many of the restored Ottoman mansions offer unique touches appealing particularly to couples, especially honeymooners. These hotels are close to all major attractions, museums, and beaches. 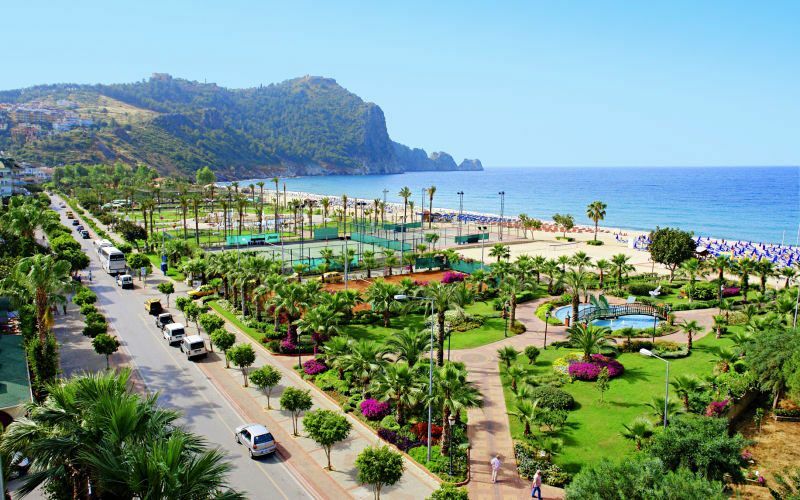 Otherwise, the Lara Beach district, halfway between Belek and Antalya city center is home to famous all-inclusive family hotels including the Titanic and Royal Wings. 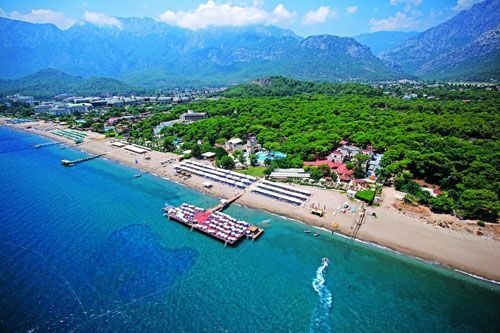 Heading around the coastline is the manmade holiday resort of Kemer. This resort is also famous for its all-inclusive hotels such as the Rixos, Crystal Deluxe, and Fantasia. Life in these hotels focuses mainly on the pebbly beachfront, middle aged and active people may find the pace too slow for them. However slightly further down the coastline are the rustic resorts of Cirali and Olympos. Both offer basic accommodation, but with an interesting natural blend with nature. As well as sharing a long beach, both are close to the ancient ruins of Olympos, and the burning flames of Chimaera. Olympos attracts the younger backpacking clientele while Cirali is middle-aged couples. Entrepreneurs recently built new hotels in the Finike and Demre districts of Antalya. However these tend to be off the beaten track, therefore most people instead, head to Kas on the outskirts of the Antalya region. It’s quite possibly the quaintest town on the Mediterranean coast due to its ability to perfectly blend the new with traditional influences. There isn’t much to do in the heart of the town, but holidaymakers join excursions or hire a car and explore further afield. The Kas Peninsula juts out from the coastline, and ideally, you should choose bed and breakfast accommodation in the heart of the town for easy access to everything. Suggestions include Sunset Village, Lycia or Meis Exclusive. While you are in Kas, spend a day exploring the Greek island of Meis that is easily reached via the ferry port. Last of the coastal holiday resorts in the Antalya region of Turkey is Kalkan, directly on the outskirts and close to the Mugla province. 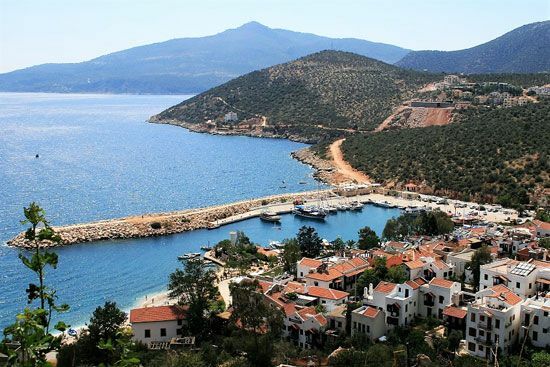 The upmarket atmosphere of Kalkan is entirely different from its neighbors, and even though it is one of the more expensive holiday resorts of Turkey, a large expat community has settled there. Foreign and Turkish property buyers rent out luxury Kalkan villas with the latest modern trends, infinity pools and amazing views over the coastline so self-catering is extremely popular, but in the town center, fine dining and basic restaurants serving a multitude of international cuisines also make a roaring trade. 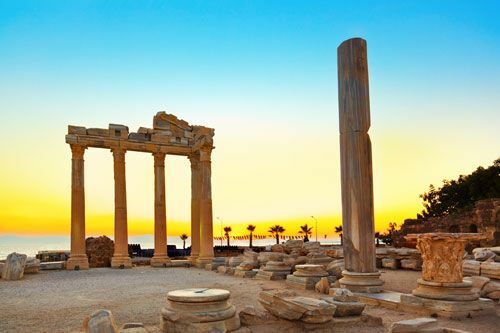 Further Reading: Another reason why the Antalya region of Turkey is so popular is the immense range of activities, and things to do, which you can read about here. Including historic sites and sporting adventures, we’ve listed it all. Alternatively, browse through our portfolio of the many cheap and modern properties for sale throughout the region.